As Lewis the Lion had discovered, Singapore has four official languages: Chinese, English, Malay and Tamil. 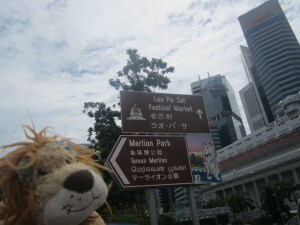 However, there seemed to be a unique hybrid spoken out on the streets which mixed the four called, ‘Singlish.’ Even though it is not an official language, Lewis the Lion thought it proudly represented the multi-cultural character of Singapore. Firstly, he noticed that the word ‘lah’ seemed to appear in most phrases. Besides that, here are some of the expressions which he learnt. Auntie / Uncle: A respectful form of an address for an older man / woman, respectively. Kiasu: A general term used to describe the highly competitive nature of many Singaporeans. It is originally a Chinese dialect expression that literally means “fear of losing”. Sometimes when Lewis the Lion heard it, he thought it sounded like someone who couldn’t speak English properly but then he realised that it is simply a different dialect of English. Why don’t you have a try at saying some of these Singlish phrases?